Quality control is of paramount importance when you are purchasing essential oils and the other raw materials required to manufacture aromatherapy products. Quinessence is totally committed to supplying you with only the very purest, therapeutically active essential oils and aromatherapy products, manufactured from ecologically grown raw materials and sustainable sources. You want products that really work, and our aim is to exceed your expectation at every level. This requires quality control procedures of the very highest order at every stage of sourcing, manufacturing, and beyond. What does Quality Control involve? Quality control involves processes, equipment and people. And with essential oils and the other natural raw materials used in aromatherapy it is our opinion that quality control should begin at the earliest stage of production, which means inspecting the crop at the growing phase. This important aspect is often overlooked when considering quality issues, and this is precisely why we have insisted on working so closely with our main suppliers. To meet this requirement, more than 25 years have been dedicated to building close working relationships with expert growers, distillers and suppliers around the world. Striving for excellence is what helped us earn our reputation, and enforcing a strict quality control system is what helps us maintain it. Wherever it is possible, we will visit the farm to inspect their facilities, collect samples and generally get to know the people who we will be doing business with. At this stage we will check to verify the botanical species of the plant, and where growers claim to have organic status we insist upon having copies of their documentation to support this. Nothing is left to chance. This is the whole purpose of a quality control regime. Before purchase, every essential oil goes through a series of searching analytical procedures to ensure that the oil has not been adulterated, stretched or otherwise 'adjusted' in any way. To achieve this, various tests are conducted to measure the physical parameters of oils, check the odour profile, and if all is well go for GC/MS analysis. Failure to meet any one of our demanding quality standards - at any stage - will result in an oil or raw material being firmly rejected. Discover more about GC analysis. After passing quality control, the raw material is purchased in bulk and the consignment is given a unique batch number and entered into the records of our raw materials database. Information recorded includes; the product name, product specification, its geographical origin, date of purchase and name of the producer or supplier. This means we are always able to trace every ingredient, of every product, right back to its source. The same level of meticulous checks are enforced on every one of the raw materials we procure to ensure that our high standards are continually upheld. Compromising on quality is not an option at Quinessence. During the process of manufacturing our aromatherapy products, the same exacting standards are rigorously imposed at every stage in order to support full traceability, whilst showing compliance with all relevant legislation and regulations. Products are filled using highly accurate computer-controlled measuring equipment in our 'clean-room' facilities. Visual inspections are made at several stages of filling to confirm that the correct volume of product is being delivered. Further random samples are taken and checked for accuracy prior to the labelling phase. All of our filling equipment is checked regularly by the U.K.'s Trading Standards Authority to ensure that this accuracy is maintained from batch to batch. Safety and quality are equally important for aromatherapy products, and we work hard to ensure that our products are suitable for the entire family. All Quinessence products provide full instructions for use, including how many essential oil drops should be used when mixing a massage blend or adding them to a bath. Tamper-evident closures are used on all essential oils, and integral drippers are incorporated to ensure that an unattended child could not swallow the oil. Four different sizes of drippers are used to ensure accurate and easy dispensing of our full range essential oils. Essential oil product labels provide the botanical name of the oil, its country of origin, instructions for use plus any contraindications that are applicable to the oil in the bottle. These are not just 'generic' instructions - everything is specifically related to the essential oil in the bottle. Every product has a batch number sticker on the bottle or jar which is recorded on our product database. To help you get the very best performance out of your products, suggested 'best before' dates are also recorded on products wherever applicable. Learn more about the shelf life of essential oils. We want to provide you with the best Customer Support possible, and therefore apply our same rigorous quality control procedures here too. As a manufacturer and distributor with 27 years experience we have developed a wide range of systems to deal with the speedy and efficient processing of all incoming and outgoing orders. A telephone Helpline service is available to all customers, supported by qualified aromatherapists who are members of the International Federation of Aromatherapists (IFA), International Federation of Aromatherapists (IFPA), The English Société l'Institut Pierre Franchomme, or the Register of Qualified Aromatherapists (RQA). Our senior therapist is a qualified clinical aromatherapist who has 29 years experience in the aromatherapy industry. Material Safety Data Sheets (MSDS) are available for professional practitioners (where applicable), and can be obtained on request. Because the purity of the essential oils will determine how successful the treatment or products will be. In aromatherapy, you will only receive textbook results when you use the very highest quality pure essential oils. 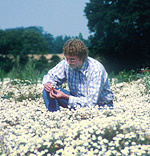 Above: Geoff Lyth inspects a crop of Roman chamomile in the United Kingdom just prior to harvesting the crop.